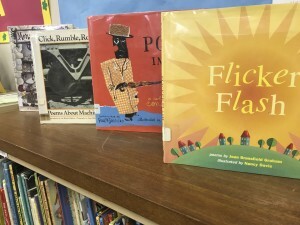 April is National Poetry Month and Library Month as well. Put the two together, and you have plenty of opportunities to celebrate both at once. 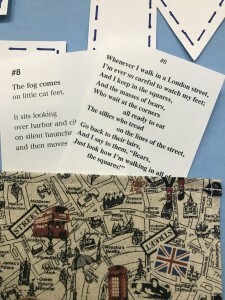 The “Poem in a Pocket Library Challenge” is one way to get students interested in checking out a wide range of poetry books and finding the treasures hidden inside. 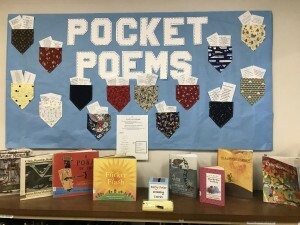 The bulletin board in the elementary library at our school is now full of colorful pockets which hold pieces of poems. The books from which these poems were plucked are lined up beneath the bulletin board. 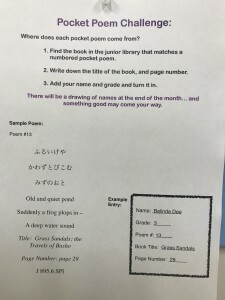 Students are challenged to read a pocket poem, find it in one of the books, grab a response slip and fill out the information: name, grade, poem number, book title and page on which the poem can be found. They then put their response slips in the poetry box. At the end of the month, all of the correct slips are gathered together and a drawing is held. The winners get a free book, (compliments of the library), and they also win a free donut party for their whole class. I even hid one of my own poems, (published in Cricket magazine), in there with the rest of some famous and some obscure poetry. 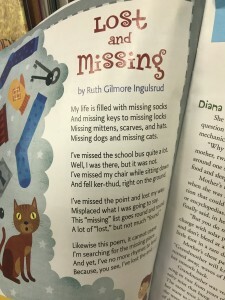 So far, no one has found “Lost and Missing,” which I suppose is poetic justice. I wonder how many of these poems they will be able to track down. Some are hidden in poetry books of many, many pages. Others are nestled in short books of translated Japanese haiku verse. The students have already started checking out poetry books and they are off on their poetry treasure hunt! It is always a treat to see such excitement in the library. 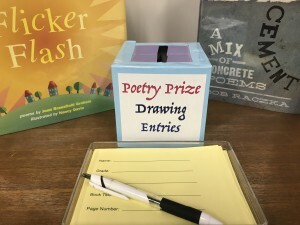 Let me know what kinds of poetry activities you have planned for your library. 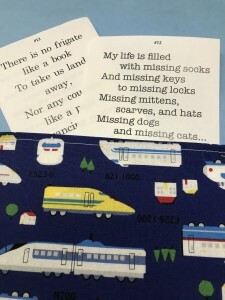 This entry was posted in Uncategorized and tagged April, library, Pocket Poems, poem, Poem in Your Pocket, Poetry, Poetry Month, poetry month ideas, teacher-librarian, teaching by ruth. Bookmark the permalink.